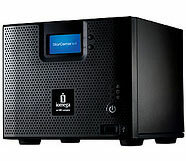 The Iomega StorCenter family of network attached storage (NAS) devices can be quickly and easily upgraded to a stand-alone professional grade video surveillance appliance (also known as a network video recorder [NVR]) designed for a digital IP surveillance system. Users simply activate network IP cameras with the embedded Phoenix RSM video management system (VMS) software. The NVR can then monitor small businesses or scale to cover large organizations. The recorded video files are retained on the StorCenter NVR with no additional need of a computer or other storage device. This solution offers a secure surveillance system with lower total cost of ownership (TCO). VMS for use with Iomega StorCenter NAS provides a powerful centralized surveillance video management capability when bundled with the Iomega NAS device. 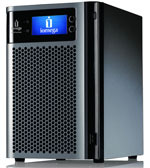 An Iomega StorCenter NVR can manage up to 20 IP cameras recording 24/7 at 30 frames-per-second, depending on the Iomega device. TRENDnet IP cameras as well as other third-party IP network cameras (spanning over 1,000 camera models from over 170 network camera manufacturers), deliver the widest camera support on the market. Video surveillance can be viewed in real time or recorded video can be played back using the VMS search tool. 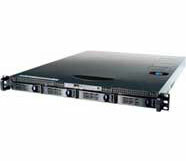 VMS for use with Iomega StorCenter NAS solution includes a setup wizard for easy configuration. It automatically searches for and finds available IP cameras on the network and then defines recording schedules and policies. Using the wizard reduces setup time of the system, and allows users to quickly start monitoring and managing from a “single pane of glass” client workstation - from anywhere on a client’s network. Use the video surveillance appliance models matrix below to best determine the scalable StorCenter options for a growing business infrastructure. With an originating StorCenter model, other units can be mixed and matched to fit developing needs of the customer. The solution does not end at one StorCenter device — additional NAS units can be added to increase video retention, support more cameras, and optimize performance. With multiple units, video can be easily moved from one unit to another, while providing search and play back capabilities from any desktop client.